After the CES Environmental Services (CES) bankruptcy, scavengers and looters removed equipment and released thousands of gallons of contaminants into the stormwater drainage system. CES a 6-acre former waste treatment and disposal facility in Houston, TX, is surrounded by residential, educational, and commercial properties. After its bankruptcy in 2010, scavengers and looters removed equipment and released thousands of gallons of waste on the ground and into the stormwater drainage system. Containers located on-site comprised 10 vacuum boxes, 2 tanker trailers, 9 frac tanks, 23 aboveground storage tanks (ASTs), 20 wastewater treatment system (WWT) tanks, 111 drums, 37 totes, 19 miscellaneous containers and vats, and debris from collection areas. The contents were acids, corrosives, flammables, and specific hazardous wastes: benzene, cresol (phenols), lead, and chromium. 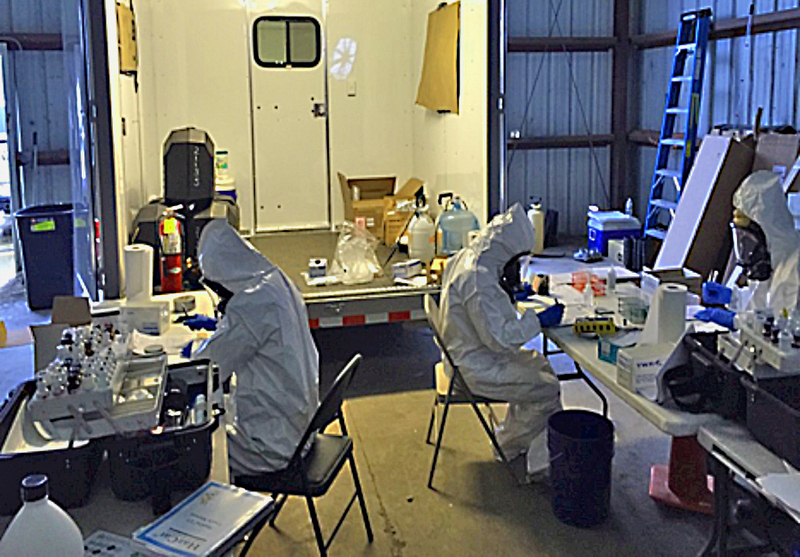 During a heavy rain event, flooding caused chemicals from the site to run off-site into a residential neighborhood. The chemical-contaminated water flooded the open drainage ditches along the street and into residents’ yards, causing discoloration of the soil and vegetation. Analysis of water samples showed concentrations of aluminum, cadmium, iron, lead, magnesium, manganese, nickel, and selenium above the Texas Commission on Environmental Quality Risk-Based Exposure Limits. The scope of work for the high-hazard removal assessment was to investigate and sample, in Level B personal protective equipment, waste material being stored on-site and to determine the approximate waste stream volumes. Multimedia samples were collected and analyzed in accordance with the Quality Assurance Sampling Plan. The removal assessment was conducted to facilitate future on-site transportation and disposal of the on-site waste. The Weston team collected confirmation samples during the removal action to confirm material identity and create waste profiles for transportation and disposal. The ASTs, vacuum boxes, frac tanks, drums, totes, and other containers were emptied and cleaned to meet the RCRA empty container requirements, as defined in 40 Code of Federal Regulations (CFR) §261.7. The removal action involved dismantling WWT feed lines and valves to inhibit future use, cutting up and disposing of drums and totes, cutting holes in all poly ASTs, and decontaminating frac tanks present on-site when EPA initiated the removal action. Feed lines to the ASTs were dismantled prior to EPA’s arrival on-site.